Geochemical Anomaly and Mineral Prospectivity Mapping in GIS documents and explains, in three parts, geochemical anomaly and mineral prospectivity mapping by using a geographic information system (GIS). Part I reviews and couples the concepts of (a) mapping geochemical anomalies and mineral prospectivity and (b) spatial data models, management and operations in a GIS. Part II demonstrates GIS-aided and GIS-based techniques for analysis of robust thresholds in mapping of geochemical anomalies. Part III explains GIS-aided and GIS-based techniques for spatial data analysis and geo-information sybthesis for conceptual and predictive modeling of mineral prospectivity. Because methods of geochemical anomaly mapping and mineral potential mapping are highly specialized yet diverse, the book explains only methods in which GIS plays an important role. The book avoids using language and functional organization of particular commercial GIS software, but explains, where necessary, GIS functionality and spatial data structures appropriate to problems in geochemical anomaly mapping and mineral potential mapping. 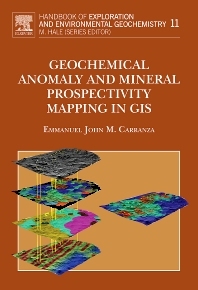 Because GIS-based methods of spatial data analysis and spatial data integration are quantitative, which can be complicated to non-numerate readers, the book simplifies explanations of mathematical concepts and their applications so that the methods demonstrated would be useful to professional geoscientists, to mineral explorationists and to research students in fields that involve analysis and integration of maps or spatial datasets. The book provides adequate illustrations for more thorough explanation of the various concepts.